Set is a warrior chosen by the sun god Ra to protect mortals from the undead who hunt them. That’s what he knows. Set doesn’t need, nor want, a mate. He’s just fine on his own, thank you very much. 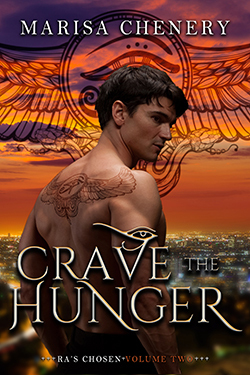 Desiree might have lusted after Set from afar for months, but that doesn’t mean she’s going to go willingly with the behemoth of a man spouting a whole bunch of garbage about immortality, an ancient Egyptian god, and her destiny as his mate. Denger is a hunter, spending his nights on the streets of Phoenix, fighting the undead who threaten unknowing humans around them. It’s in his blood. It’s what he knows, but a new knowledge has taken hold. After the death of her husband three years ago, Nyx is content to spend her evenings at home, wrapped up in the vampire romance novels she loves. When she collides, literally, with a man who could have stepped out of the pages of her books, she begins to think that living her love life through books might not be the way to go. Akori wants nothing to do with this whole mate business. Some of his fellow warriors might have succumbed to what Ra deems an inescapable fate, but Akori knows better. Jordan didn’t expect to find the added bonus of a hotter-than-hell man while out scouting photoshoot locations, but her artistic eye knows what sin in jeans looks like, and this guy is it.